The Complete Pixel Portrait Sessions-Capturing life's enchanted moments. Some moments in life pass too quickly. Children at that magical age, a special relationship or a family on life’s journey. A photograph is a moment frozen in time. It captures the unique personalities and intimate moments that tells the story of your life. Our Portrait sessions are all about capturing the unique personalities of our subjects. After spending a bit of time consulting with you to determine the types of images you are hoping to capture, we can arrange our in studio or outdoor location session. Whether you are looking for a contemporary portrait, a family portrait or a fine art portrait, The Complete Pixel is dedicated to creating exceptional images for you to treasure. 2 – 5 x 7 prints on high quality professional photographic paper using archival quality inks. 1 – 8 x 12 (A4) prints on high quality professional photographic paper using archival quality inks. 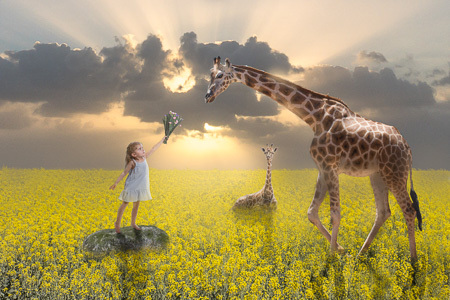 The Fine Art Composite is the art of blending multiple photos to create an emotionally compelling image that tells a story. A unique and different style of portrait that captures your specific personality and interests. A piece of art that is personalised for you. Development of the background image prior to the photo shoot. Our range of cost effective portrait packages will ensure that all of the special family memories are captured perfectly. To book The Complete Pixel for your portrait session, or if you have any additional questions about our services, please contact Brian on 0448 455 115. Alternatively you can also contact us by filling in our on-line ENQUIRY FORM.